What’s in an email signature? How about anything you want! If you want to add more traffic to your sites, blogs, and social networking endeavors, you need to check out Wisestamp. It works great with Google Gmail, and every email signature can be customized and setup to YOUR specific liking. Creating your unique and custom email signature takes only a few minutes and allows those receiving your emails and replies to see where you’re active, what you’re currently up to, and what sites you’re actively involved in. 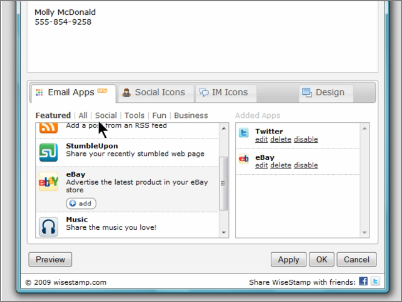 Wisestamp turns your email signature a syndicated marketing and social networking tool. Take a look, try it out yourself, you’ve got nothing to lose because it’s FREE, and everything to gain from the additional exposure it will bring to you, your sites, and the bottom line of whatever business you’re in. Stamping your work with a signature of quality is important these days, Wisestamp lets you do just that! Love wisestamp, I’m sure there are others, but for gmail, I like wisestamp best!